New edition with an update on the UN investigation sparked by the book’s initial release. The death of UN Secretary-General Dag Hammarskjöld remains one of the biggest mysteries of the twentieth century. Shortly after midnight on 18 September 1961, an aircraft carrying Hammarskjöld and his UN team crashed into dark forest in the British colony of Northern Rhodesia (now Zambia), abruptly ending his mission to bring peace to the Congo. Many around the world suspected sabotage, pointing the finger at Britain, Belgium, the USA, and South Africa, as well as the huge multinationals with mining interests in the region. These suspicions have never gone away. A man who cared deeply about social justice, Hammarskjöld sought to shield the newly-independent nations from the predatory aims of the Great Powers. His enemies included colonialists and settlers in Africa who were determined to maintain white minority rule. 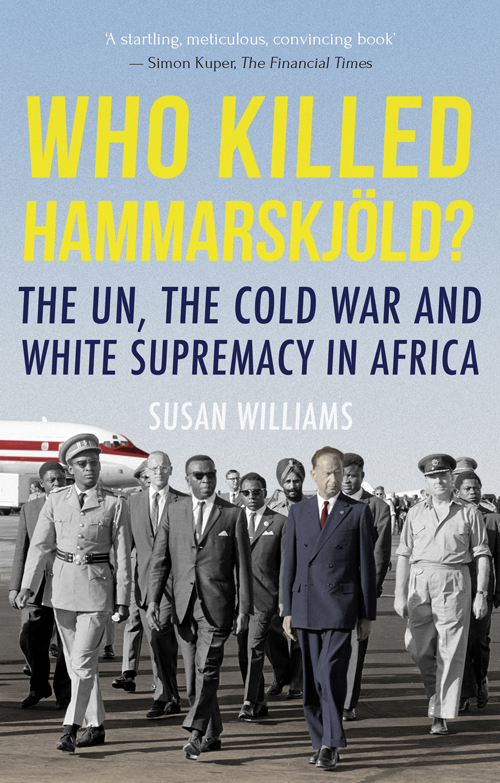 In Who Killed Hammarskjöld?, Susan Williams carefully navigates a mass of secret documents and witness testimonies suggesting a massive cover-up, to present a case which has already triggered a new investigation by the United Nations.